A fascinating game by Avalon Hill, ahead of its time in concept, but with a dated rules set. PC's begin as ordinary people, and slowly discover their super-human powers. The game features time travel, dimensional adventures, and cool weirdness. 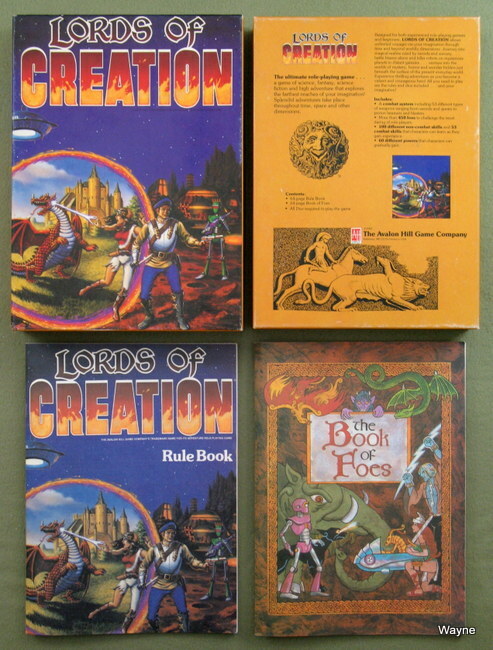 The set includes the rules book and the Book of Foes. 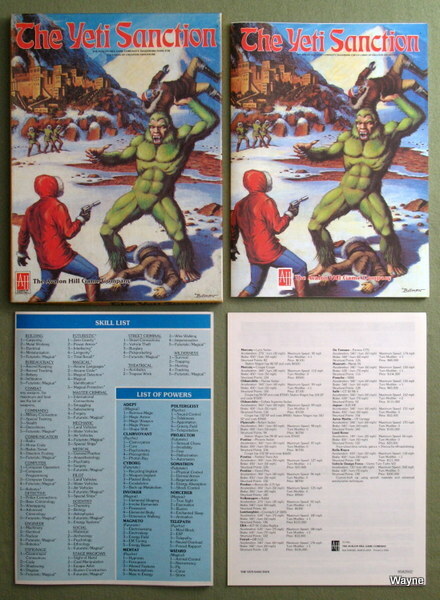 Included in the rule books are a combat system (With 53 different types of weapons ranging from swords and spears to proton beamers and blasters), more than 450 foes to challenge the most daring of role-players, 100 different non-combat skills and 53 combat skills that characters can learn as they gain experience, and 60 different powers that characters can gradually gain. "The ultimate role-playing game . . .
a game of science, fantasy, science fiction and high adventure that explores the farthest reaches of your imagination! Splendid adventures take place throughout time, space and other dimensions. Designed for both experienced role-playing gamers and beginners, LORDS OF CREATION allows unlimited voyages via your imagination through time and beyond worldly dimensions. Journey into magical realms ruled by swords and sorcery . . . battle bizarre aliens and killer robots on mysterious planets in distant galaxies . . . venture into the worlds of mystery, horror and wonder hidden just beneath the surface of the present everyday world. Experience thrilling adventures as you become a valiant and courageous hero! All you need to play are the rules and dice included . . . and your imagination!" "The Horn of Roland is a Lords of Creation adventure module for newly-created player characters. The adventure begins at a present-day gaming convention. The characters are faced with a series of bizarre events, including a murder mystery. During the course of their investigation, the characters chance upon stranger and stranger settings, until they eventually confront their ultimate adversary. 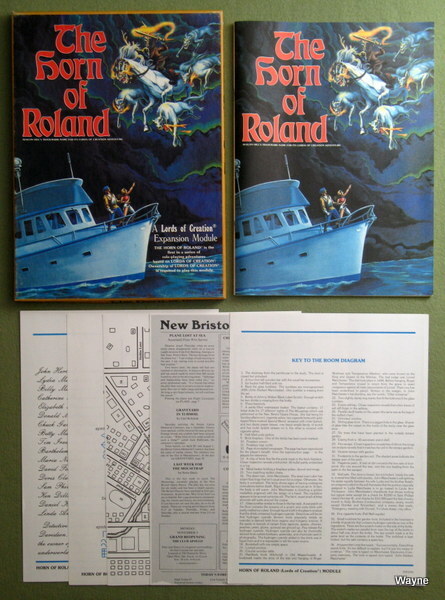 The Horn of Roland contains a 48-page adventure and 5 special player aids, including maps of the area and a diagram of the murder scene." This box includes a 32-page book and a 3-panel GM screen. The player characters have to rescue the Secretary of State from a terrorist group. 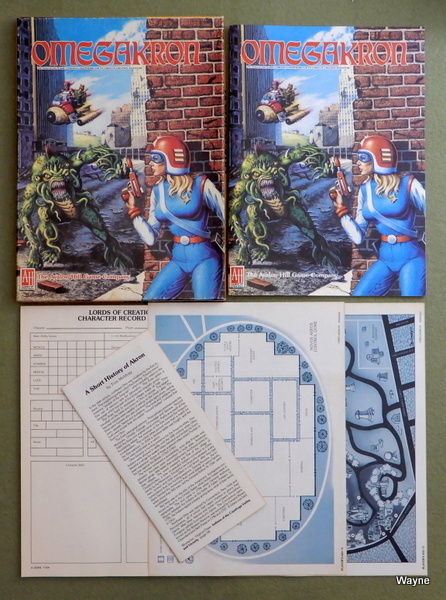 This box includes a 32-page book, Player's Aid #s 1-5 and a pad of character sheets. It contains an adventure in post-holocaust Ohio. "After the bombs dropped, civilization collapsed. Radioactive dust fell as lethal rain. The fearful warfare spewed forth a host of toxic gases and spawned incurable man-made plagues. The living battled against starvation while unburied dead hosted contagious diseases. It had been a short terrible war...the only victor was death. But a few survived. Two centuries later their descendants were still struggling to rebuild. Despite such scientific discoveries as intergalactic travel, most of the land was a howling wilderness. In the ancient city of Akron, the domed strongholds of Novos Akros had achieved high-tech status at the cost of human freedom. Some semblance of the old democracy was maintained by the university area, now known as Old Akron. Most of the ruined city was controlled by five street gangs: the Psychos, the Death Angels, the Slashers, the Mohawks and the Rattlesnakes. Intelligent, mutated animals ruled those parts of the city which had returned to primal forest. Mutant bands controlled fortified skyscrapers. Cyborgs mined the city ruins, while Androids, travelling in giant airships, carried trade across the radioactive outland. The city was anything but safe. At night, people huddled indoors, for darkness was the realm of the cannibalistic Dirges. Even in the daytime, some new horror might wander in from the wasteland. Had we arrived in this desolate world by sheer chance, or were other forces at work? And how did the cryptic message from our friend Prometheus fit in? Well, first things first. Right now we had to concentrate on survival...we could solve the puzzle later! OMEGAKRON is a Lords of Creation adventure module for player characters with a Personal Force of 25 or less. The ideal Personal Force for characters at the start of the adventure is 19-23, but even beginning characters have a chance to survive if they are careful and lucky. The characters mysteriously appear in the city of Akron, 200 years after a nuclear holocaust. The only hope of finding their way home again lies in a cryptic vision sent to them by their friend and ally, Prometheus."